Making its world debut at the Fort Lauderdale boat show is Cheoy Lee’s latest Express model, the Alpha 87 Express Sportbridge motor yacht. Cheoy Lee is known for its oceangoing motor yachts, but since the introduction Alpha series with the Alpha 76 Express Sport model – followed by the Alpha 76 Express Flybridge model and the Alpha 87 Express Sport yacht – the builder has been making a name for itself in the express yacht market. Now introducing the first-ever Alpha 87 Express Sportbridge model, Cheoy Lee has been fine-tuning its Express series. 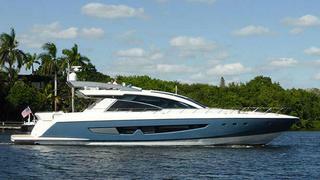 This is its second model to feature a flybridge, after the Alpha 76 Flybridge. Twin Caterpillar C32s engines deliver high performance, with the Alpha 87 Sportbridge estimated to reach a top speed of 33 knots. Her tender is stowed in a dedicated garage. The 87 Sportbridge motor yacht features naval architecture and styling by Mike Peters, while her interior design by Luiz de Basto. De Basto has given the 26.5m yacht a bright, contemporary motif highlighted in dark veneers and light-coloured, reflective fabrics. The 87 Sportbridge features a spacious en suite owner’s stateroom for a yacht of its size; the full-beam stateroom cabin features a king-size bed. The Alpha 87 showed off her blue hull and contemporary interior during an evening cocktail party at the Fort Lauderdale boat show. She features an open-plan saloon, with the galley integrated into the layout of the main deck along the portside, across from the lounge. The futuristic helm is a highlight of this yacht series, and the helm area is open to the lower deck, allowing light to flow into the a foyer and creating a spacious, atrium-style feel below decks.